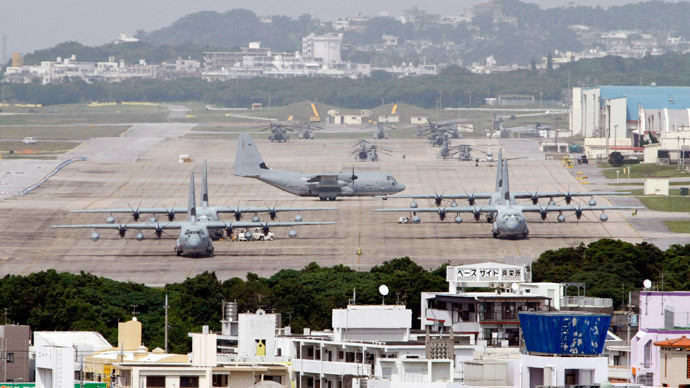 The Japanese government is pleading with the head of Okinawa Province to allow the construction of a US air base. Takeshi Onaga says he understands the importance of the alliance with Washington, but the plan must have the support of the Japanese public. The construction of a new US air base in Okinawa has been rumbling on for almost two decades, after construction was first mooted in 1996. However, there has always been strong opposition from the island’s residents in the southern most Japanese province. Locals say they should not have to carry the burden of hosting more than half of the 47,000 US troops based in Japan. Chief Cabinet Secretary Yoshihide Suga told the Okinawa governor of the need to start building the base, ahead of a visit by Japanese Prime Minister Shinzo Abe to Washington later in April. "We hope to get your understanding on the plan... for maintaining the deterrent power of the Japan-US alliance,” Suga told Governor Onaga, according to AFP. Onaga, who won a gubernatorial election in 2014 on the back of a pledge to stop construction of the planned Nago base, says he is still hopeful of keeping to his electoral pledge. "Okinawa never voluntarily offered (land) for bases. I'm convinced that it is impossible to construct a new base," Onaga said. While a significant proportion of the Japanese population value the presence of US servicemen in the country as a deterrent, especially with Beijing reasserting itself as a regional power, many living in Okinawa would like to see a vast reduction of the 26,000 US personal currently on the island. The Japanese government recently won a partial victory after the country’s fisheries minister intervened on behalf of the development. On March 30, Yoshimasa Hayashi “temporarily invalidated” the Okinawa governor’s order to halt construction of the base. He cited the "great damage to diplomacy and defense policy by having a negative impact on the Japan-US relationship, as well as affecting residents near Futenma,” if the base was ultimately postponed. Earlier in March, Governor Onaga sought to block plans for the new $8.6-billion air base by claiming an underwater survey had determined the project would damage coral reefs near the planned construction site. In 1996, it was agreed the current Futenma Air Base, located in a densely populated urban area, would be closed down. This followed a diplomatic spat after a local 12 year-old Japanese girl was gang raped by three US servicemen.